Being poor and marginalised means being deprived of many options and services – among others, infrastructure and electricity. 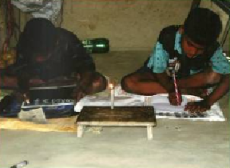 Hundreds of millions of people in rural India depend on lighting with petroleum, i.e. kerosene lamps. These lamps give very little light only, but consume lots of costly fuel which is difficult to get in many places. Moreover, the open flame is dangerous and easily causes fire accidents. The fumes of the lamps are quite poisonous, leading to lung problems, upper respiratory infections, and sore eyes. Alternatives to fuel lamps are available even for off-grid situations: modern portable lamps with white LEDs. Their in-build battery is charged with solar power, meaning that no fuel is consumed or electricity needed. These lamps are almost maintenance-free and give up to 100 times more light than the old kerosene lamps. Their only disadvantage: the cost for acquisition is too high for most people. Over the years, poor people spend much more money on their kerosene lamps than they would on solar lamps. But they spend it in small amounts, so they cannot build up an appropriate sum to afford solar lighting. Therefore, availability of decent light is not a technical problem, but a development issue. The marginalised pay way too much for the poor lighting they use. Still, they are deprived of adequate lighting for improving their living conditions and enhancing their income activities at night time. Renewable Energy provides an excellent way out of this situation as it is possible to build up an electricity system away from grids and companies. Combining proven instruments for sustainable, community-based development can overcome these problems: financing with revolving funds and micro-credit (especially for necessary replacements), and charging and servicing with a community-owned central solar kiosk. That brings energy back in peoples hands! Bright, efficient, portable – solar home lights are not only a perfect solution to dim petroleum lights, but a fine piece of technology, too. With one full charge of their battery, the provide up to 300 hrs of clean light. Even in the highest power mode, the battery lasts for about 30 hrs. This means that only one charge per week is required. People take their lamp to the “Solar Energy Kiosk” in the morning and can pick it up in the evening, fully charged and maintained by a trained technician. The whole service is community based, so there is no electricity monopoly in the village and providing energy is a community-issue. The fee they pay for this service is minimal and much lower than what they used to spend for fuel, but they get much better light. Moreover, the Energy Kiosk will slowly turn into the development center of the village – providing meeting space for women’s groups, offering a counter for community based micro credit etc.